Sometimes it’s all about conveinance and this meal definitely was. The best part, it was full of flavor but ready in minutes. 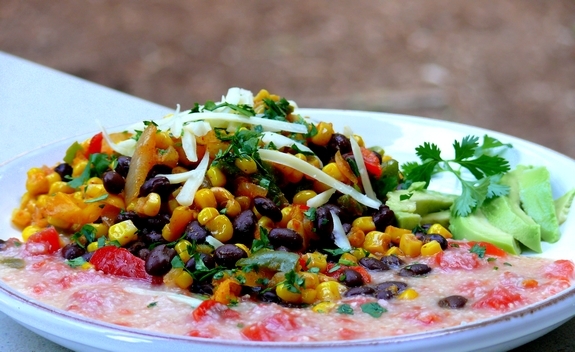 The cheesy, salsa-flavored grits are the base for this simplistic vegetable saute. By utilizing frozen veggies from the refrigerator and a couple of canned goods from the pantry, this meal was on the table in no time. It’s also vegetarian, a good break from all the red meat we seem to eat around here. In my house, “grits” has always been called “polenta” and there is nothing like real, stone-ground grits (polenta), but in a pinch, instant worked great. There is lots of flavor here, it’s really a nice meal. Quick grits can be found near the oatmeal and other hot cereals or near cornmeal in the baking aisle…look for it. Now, would my kids eat this? No. Too many foods touching each other but for me….the perfect lunch or dinner. Combine water, salsa (or tomatoes) and grits in a large saucepan. Bring to a boil. Cover, reduce heat to maintain a simmer and cook, stirring once or twice, until thickened, 5 to 7 minutes. Remove from heat and stir in 1/4 cup cheese. Keep covered. (The grits will thicken slightly as they stand.) Season with salt to taste. Serve the bean and vegetable mixture over the grits, sprinkled with the remaining 1/4 cheese and cilantro. NEVER considered salsa grits. Most southerners love grits, I’m no exception, will try this, thanks! Definitely a great side dish to go with grilled fish, blackened fish, or broiled flounder. My husband loves grits more than any other grain. Thanks for this one. This sounds super yummy! Love the salsa grits! We keep both in the house and they are much beloved. Salsa grits would go over well because I love experimenting with new ways to flavor them up.